Slavery created enormous profits not only for Southern planters and slave traders, but also for Northern cotton-mill owners and investors. Nearly one million enslaved Africans, defined as property, were wrenched from their upper South families. Some bought their freedom; more fought back by running away or even taking their own lives. Slaves were often sold off the plantation for later auction. In the scene depicted in the American Enterprise exhibition, set in the upper South, the parents had no warning when traders came for their son. You can learn more about this sculpture's purpose and design in the O Say Can You See blog post, "Depicting the business of slavery." 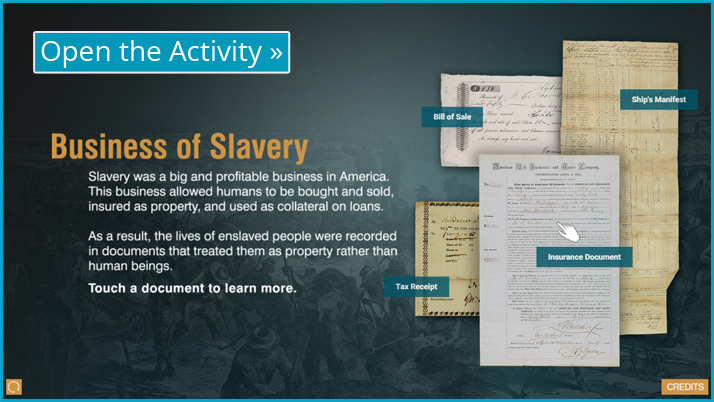 Learn more about the business of slavery by exploring four historic documents from the United States slave trade. Click on the screenshot above to open the interactive display in a new window. This ship manifest recorded the January day when eighty-three slaves of the upper South embarked on a journey to an unknown location and undetermined fate in the Deep South. It was likely they would never see their families again. Tax collected on slave sales, on property that included the value of slaves, and on estates served as signifigant sources of revenue for state and local governments. The business of slavery included the production of standardized printed forms for the slave trader's use. Typically such forms just proved that a transition took place; this once concerned the sale of a human being. A notorious slave trader and a U.S. Senator from Rhode Island, DeWolf defied government laws restricting the slave trade by evading customs inspections and using Cuba as his slave depot. His commerce in slaves, along with his cotton manufacturing interests, brought him great wealth and political prominence. Slave traders were often skilled businessmen who understood the power of advertising. Pennsylvanian Lewis Miller viewed this public sale of slaves when he visited his brother in Christiansburg, Virginia. The slaves' names may substantiate the accuracy of the scene.